Twig of False acacia with vicious thorns. The emerging buds are seen at the base of the paired thorns. On the Heathland 26th March 2006. False acacia in flower on the heathland. The compound pinnate leaf has 9-23 oval leaflets. Photo: June 2005. Seed pods of False acacia. They persist throughout the winter. Here they are seen with the spring leaves. False acacia on the Heathland. It also occurs in Hainault Lodge. Photo: © Vic George Trunk of False acacia in Hainault Lodge Reserve is ridged vertically. Found on the Heathland area, and sending up many prickly suckers, the Woodland Trust are trying to eradicate it. It was planted inappropriately here by the G.L.C. in the mid 60's and since then it has become a problem. 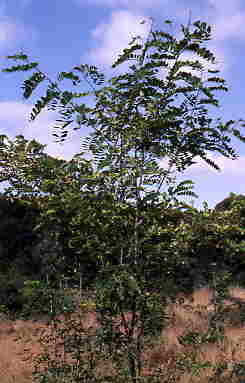 The suckers can grow 2 -3 metres (8 foot) in one season. Some mature trees are present in the Hainault Lodge Local Nature Reserve. It has pea flowers, followed by pods in the autumn. Despite many seeds the germination is poor, relying on suckering for propagation.